Preface. Historical developments in convergence analysis for Newton's and Newton-like methods (T. Yamamoto). The theory of Newton's method (A. Galántai). A survey of truncated-Newton methods (S.G. Nash). Variable metric methods for unconstrained optimization and nonlinear least squares (L.Luksan and E. Spedicato). Practical quasi-Newton methods for solving nonlinear systems (J.M. Martínez). Sequential quadratic programming for large-scale nonlinear optimization (P.T. Bogs, J.W. Tolle). Trust region model management in multidisciplinary design optimization (J.F. Rodríguez, J.E. Renaud, B.A. Wujek, R.V. Tappeta). ABS algorithms for linear equations and optimization (E. Spedicato, Z. Xia, L. Zhang). Automatic differentiation of algorithms (M. Bartholomew-Biggs, S. Brown, B. Christianson, L. Dixon). Direct search methods: then and now (R.M. Lewis, V. Torczon, M.W. Trosset). Recent developments and trends in global optimization (P.M. Pardalos, H.E. Romeijn, H. Tuy). Numerical continuation methods: a perspective (W.C. Rheinboldt). 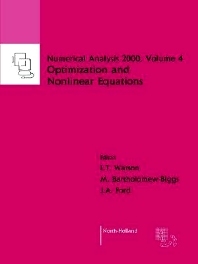 Piecewise linear methods for nonlinear equations and optimization (E.L. Allgower, K. Georg). Interval mathematics, algebraic equations and optimization (M.A. Wolfe). Interior-point methods (F.A. Potra, S.J. Wright). Complementarity problems (S.C. Billups, K.G. Murty). Evolution and state-of-the-art in integer programming (H.D. Sherali, P.J. Driscoll). Combinatorial optimization: Current successes and directions for the future (K.L. Hoffman). Optimal control (R.W.H. Sargent). Author Index. /homepage/sac/cam/na2000/index.html7-Volume Set now available at special set price ! In one of the papers in this collection, the remark that "nothing at all takes place in the universe in which some rule of maximum of minimum does not appear" is attributed to no less an authority than Euler. Simplifying the syntax a little, we might paraphrase this as Everything is an optimization problem. While this might be something of an overstatement, the element of exaggeration is certainly reduced if we consider the extended form: Everything is an optimization problem or a system of equations. This observation, even if only partly true, stands as a fitting testimonial to the importance of the work covered by this volume. Since the 1960s, much effort has gone into the development and application of numerical algorithms for solving problems in the two areas of optimization and systems of equations. As a result, many different ideas have been proposed for dealing efficiently with (for example) severe nonlinearities and/or very large numbers of variables. Libraries of powerful software now embody the most successful of these ideas, and one objective of this volume is to assist potential users in choosing appropriate software for the problems they need to solve. More generally, however, these collected review articles are intended to provide both researchers and practitioners with snapshots of the 'state-of-the-art' with regard to algorithms for particular classes of problem. These snapshots are meant to have the virtues of immediacy through the inclusion of very recent ideas, but they also have sufficient depth of field to show how ideas have developed and how today's research questions have grown out of previous solution attempts. The most efficient methods for local optimization, both unconstrained and constrained, are still derived from the classical Newton approach. As well as dealing in depth with the various classical, or neo-classical, approaches, the selection of papers on optimization in this volume ensures that newer ideas are also well represented. Solving nonlinear algebraic systems of equations is closely related to optimization. The two are not completely equivalent, however, and usually something is lost in the translation. Algorithms for nonlinear equations can be roughly classified as locally convergent or globally convergent. The characterization is not perfect. Locally convergent algorithms include Newton's method, modern quasi-Newton variants of Newton's method, and trust region methods. All of these approaches are well represented in this volume.